An annual for amateurs and specialists growing and showing daffodils, snowdrops and tulips. 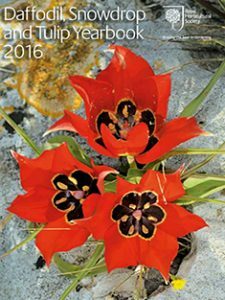 The 83rd edition of what began as the Daffodil Yearbook and has grown into the Daffodil, Snowdrop & Tulip Yearbook bring topical notes and articles, show reports, book reviews and news of awards to plants and people. This new edition contains recommendations for good garden plants on daffodils, first pictures of certain new or rare cultivars of snowdrops and advice on starting a new snowdrop collection. And for tulips, different classifications of the genus are compared and a new one proposed with wonderful habitat shots of species in Israel. Complete with beautiful images of all three plants. This entry was published on 2016年11月7日 and was updated on 2016年11月7日 / 日本水仙協会. Posted in ニュース. Bookmark the permalink.